Shomer Shekalim offers free workshops to help freelancers understand and take control of their fiances. If you’re interested in organizing such an event for a small group of freelancers (4–10 people) please e-mail me at jonnydegani@gmail.com or call me at 052-790-6824. Unlike salaried workers, freelancers (עצמאים) have no minimum they must set aside for their pension. Unfortunately, this leaves freelancers with the responsibility of making sure that they have money for retirement in addition to the appropriate level of life and disability insurance. But there is some good news. Freelancers have significant tax benefits to saving through a pension and keren hishtalmut. Pension: An עצמאי can deposit up to 16% of his salary into a pension. Of this 16%, 5% gets you a 35% tax credit and 11% is tax deductible. OK, now in English: Lets say you make NIS 100,000 a year. 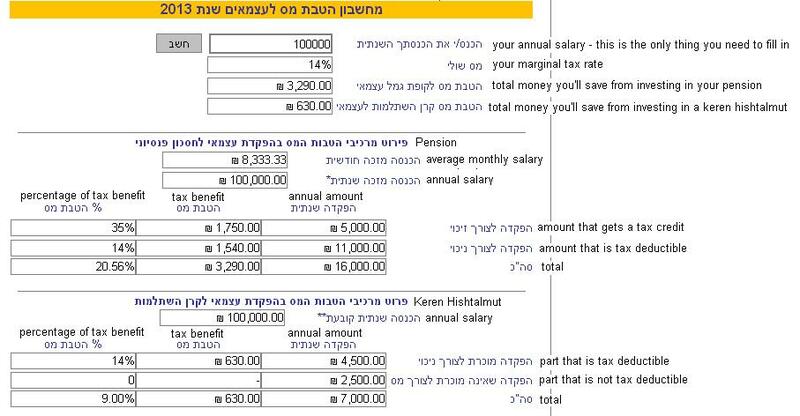 If you deposit NIS 16,000 in your pension, you get back 35% of NIS 5,000 = NIS 1,750. Also, the other 11% is tax deductible, so at the end of the year, you’ll pay taxes on NIS 89,000 instead of NIS 100,000. In addition, a freelancer can give himself a keren hishtalmut, a mutual fund that grows tax free and becomes liquid after six year. A freelancer can set aside up to 7% of his salary, 4.5% is a tax deduction. This is a link to a calculator from beinleumi that calculates how much you can put aside for a keren pensia and keren hishtalmut and the subsequent tax breaks you’ll receive. To be clear: a זיכוי is a credit which means 35% of it is money back in your pocket. ניכוי means a tax deduction, which means that it is as if you never made that money for the purposes of your paying taxes. For your convenience, I translated the calculator in the image here (click to enlarge). For help understanding the pension system, see my series on pensions in Israel. If you’re interested in choosing a pension or hishtalmut, please contact me at jonnydegani@gmail.com or 052-790-6824. In my next post, I’ll make sense of the barrage of insurance offers that atzmaiim receive from insurance companies and agents and discuss what is more important, what is less, and what should be completely ignored. By jonnydegani in other everyday investments, pensions on May 7, 2014 . A keren hishtalmut is a mutual fund and there are literally hundreds of options at pretty much every point along the spectrum of conservative to risky. I briefly discuss the topic here. If you need help choosing a keren hishtalmut, please feel free to contact me.